Inspired by one of my favorite blogs, Coffee Break. 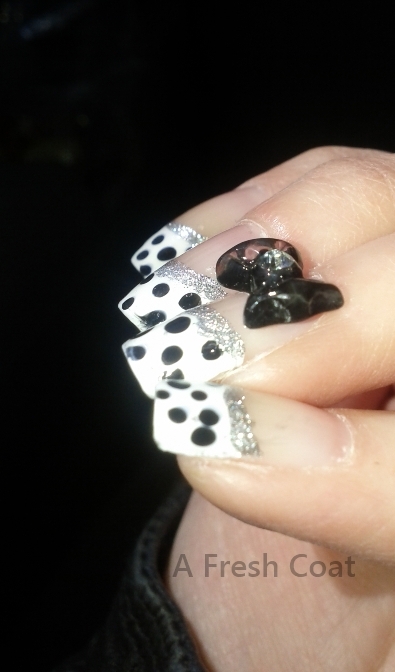 This was my first time using a large 3D object on my nail. I kept it attached with some nail glue and it worked out pretty good. I wore them for 24 hours expecting them to fall off, but the bows stayed on the entire time! The only downfall was that the glue was hard to remove. It really had to be scrubbed with acetone. I purchased these bows in a package of 20 for about $1.50 from eBay. I got the nail glue for $2 or $3 from Walmart in the nail section.